What is TIS 2000 Software? A lot of info I found over at SaabCentral but it is just a giant thread to read through although a lot of the info is on the first page. And a lot doesn’t apply since it’s geared towards Saab (even the 9-7x doesn’t apply, it’s under GM). So you have a Tech2 but a lot of the things you would like to do is locked out because you don’t have access to the computer software to allow you to do it. Things like updating PCM’s and modules and anything security related are locked out. If you bought one of the Tech2 clones, it probably came with a CD with the Tis2000 software. If you install it and try to use it, it says that it can’t find the USB security dongle or something like that. That’s because only dealers have those or a clone of one wasn’t included. First of all, this is old software. It was discontinued in 2008 by GM which means that it works only for vehicles up to model year 2007. It will have PCM and module updates included. For example, I was able to update all of the modules and PCM in my 2006 9-7x even though it had only been a year or two since production and issue of this software. It will also allow you to reprogram a module that you are replacing. 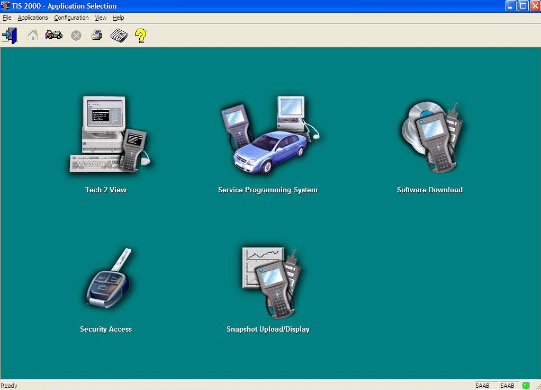 The Tech2 communicates with the computer using a serial port on the computer running Windows XP SP3. This can be a problem if you only have newer computers. Best and easiest scenario is to use an older laptop computer that has a serial port running windows XP. In my setup, I used an old IBM T40 laptop, which is fairly decent processor wise, installed a fresh copy of Windows XP SP3 and used a docking station with it that has a serial port. Laptops that have actual serial ports built in are probably so old that they are too slow or have age and reliability issues. Another solution would be to get a USB to serial port adapter and specify the proper COM port number during the install of Tis2000. Another possible solution would be to use a virtual environment on a host computer. VMWare is free to use and it has been done from what I read but could be a fairly involved process because of the serial port issue, especially when using a USB to serial adapter. The challenge of communicating from the virtual environment through the real computer’s hardware ports can make it difficult but can be done. I’m not going to discuss this type of installation but the basic software installation and use will be the same. If anyone gets a virtual install working, please post it up. In some detail, this is what I did. Keep in mind that you should have some computer knowledge and know how to install Windows. 1. Installed a fresh copy of Windows XP SP3. I didn’t bother with updating anything else as far as security updates to Windows or install a virus scan because this computer will never be connected to the Internet or used for anything else. 2. Installed ALL the required drivers until there were no more yellow check marks in Device Manager. I failed to do this at first and caused a lot of headaches later, including a BSOD during software installation. 3. If you’re using a USB to serial adapter, plug it in now and set it up. Go into Device Manager and make note of the COM port used by the adapter. 3. Install the Tis2000 software from the CD included with the Tech2. During the install, it will ask you to specify the COM port. If you have a serial port on the computer, it’s probably COM 1 or use the one from the USB adapter. 4. Before you can use Tis2000 with your Tech2, you have to make it “think” that there is a dongle connected that authorizes it. You can download the crack below. Follow the read me file for instructions on how to use it. That’s it. More threads will come explaining how to do stuff with it but this will get you going. When you click on the links, they will bring you to 4Shared, click on “Free Download”, a little window will pop up asking to log in using either a social media account or sign up for an account. Sign up with an email and password and then create a name. After that, you will be brought back to the download page and the 60 second timer will count down, after which the download will start. Warning: In Tis2000, whatever you do,DO NOT USE THE “SOFTWARE DOWNLOAD” BUTTON!This will retrograde the card in your Tech2 to an old version from 2008. Some more install info, especially for VM’s, is also available in this thread from SaabCentral. 4) Load DATA DVD (tis2000+data+0802) to run TIS200 on desktop after compete install the setup. TIS2000 will update the data automatically. 8) Start ECU programming and follow the windows prompts. If you order GM Tech2 scanner with Saab software, you’d better choose Saab TIS2000 CD with USB key. 1.Mount the .iso for to install GlobalTIS and during installation click in all windows “Next”! DO NOT CHANGE anything and leave all AS THEY ARE! 2.When installation finish, 1st DISABLE any Firewall that you have all ready enable! 3.Run the GlobalTIS and go and FILL Dealer info form (anything you wish…) BUT FULL filling! 12. Install now the apearing & needing Plugins! 64-bit versions of Windows contain backwards compatibility with 32-bit applications, but not with 16-bit applications. And 32-bit versions of Windows are backwards compatible with 16-bit applications. The problem with installing TIS2000 on newer machines is that, while the TIS2000 program itself is 32-bit, the installer and drivers are 16-bit. Therefore, you are able to install TIS2000 natively on ANY 32-bit Windows system. This will just work, without having to run anything in compatibility mode. However, if you have a 32-bit copy of Windows 8 installed (I don’t wanna know why you do), running 16-bit applications are disabled by default. You can enable it by going to Control Panel and clicking on 16-bit Application Support then clicking Enable. This allows you to make a complete backup image of your hard drive, and allows you to flash it back to that drive at any time. A good thing to have around anyway. I do not have a Tech 2 device and am unable to test that everything is working with any of these methods. However, I see no reason why these solutions will not work with a RS232 to USB Convertor on any computer you may have without a serial port. A1:how to install and use the keygen for globalTIS? Run the gtis install. It’ll prompt you for a dealer ID. I don’t think it actually matters, but I googled “Saab dealer ID” and used the six digit number I found… maybe 218599? Whatever. After you install it, run it and it will prompt you to register. Fill out all the dealer information (fake info…) and make sure you select register via fax. It will spit out a PDF – save that on your desktop or whatever then exit gtis. Open the PDF file you saved to your desktop and get the software key number – it’s really long with a bunch of hyphens Open a command prompt, go to the gtis webserver folder, and run keygen.bat followed by that long software key number – REMOVE ALL THE HYPHENS. It’s great to type keygen [long number] > regcode.txt so that the output of keygen gets put in regcode.txt so it’s easy to copy and paste. Fire gtis back up and it will continue the registration process. Open regcode.txt – there will be a short number and a long number. Cut and paste them into appropriate boxes in gtis.